CenterPointLock Premier Series Urostomy Pouch is a urostomy pouch specifically designed to provide an optimal amount of security and confidence for users. Built with a drain valve and an internal non-reflux valve to allow for complete regulation of flow rate, this urostomy pouch prevents urine from backing up into the drain tube or backing up into the skin barrier. 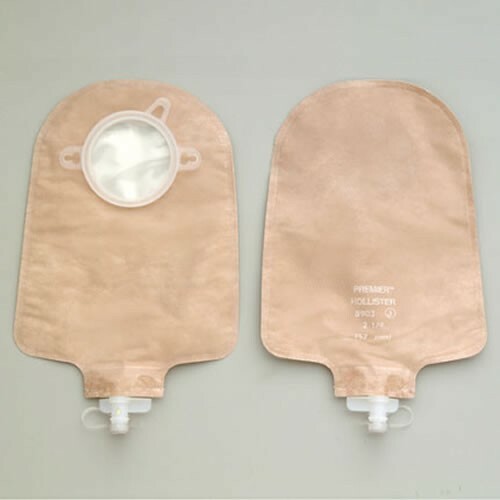 Beige in color from the front and transparent in the back, these pouches are ideal for elderly patients or patients with limited vision. CenterPointLock Premier Series Urostomy Pouch are designed to be ultimately comfortable and are woven with soft ComfortWear panels on both sides to provide a soft, cloth-like covering between the skin and the pouch. The skin barrier within the pouch prevents the pouch from causing stoma irritation or other skin discomforts and creates a completely discreet, odor-free and protected user experience. You may also be interested in similar urostomy pouch products, such as Hollister Premier Series Urostomy Pouch. Provides complete security and confidence for users via a drain valve and an internal non-reflux valve that allows for regulation of flow rate. Designed with soft ComfortWear panels on both sides to give it a soft, cloth-like covering between the skin and the pouch. Equipped with integrated odor-barriers and rustle-free film for comfort and features an anatomically shaped pouch and leak-proof clamp closure. Comes with Finger cut belt tabs for adjustability and recommended for at-home use. Can be used while bathing, swimming or enjoying additional water activities.